Info "Move the slide around under the microscope to find the virus that matches the example. Wooohoooo... VIRUS DANCE PARTY!" Rock Fever is a microgame found in the Total Drag stage in WarioWare: Touched!. The name is a pun on the disease of the same name, also known as brucellosis. 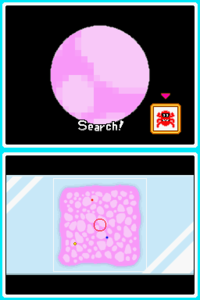 The objective of the game is to drag the slide to zoom in on the virus that matches the one displayed on the top screen's corner. This microgame has more time to complete than other microgames. 1st level difficulty: There are three viruses to choose from. 2nd level difficulty: There are four viruses to choose from, and some of them are similarly colored. 3rd level difficulty: There are five viruses to choose from, and some of them are similarly colored. This page was last edited on April 6, 2018, at 10:57.